What could feel more festive than a Snowman at Christmas? 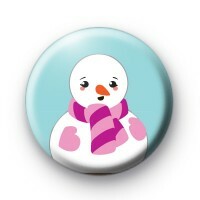 This cute 1-inch snowman badge is super cute and wearing pink gloves & scarf, it would make a lovely handmade stocking filler or a nice badge to give out to at a festive party at work or school. Our Christmas badges are all handmade and add a touch of festive magic to an outfit or work well incorporated into your own holiday craft projects.